According to Fidelity, as of September 2018, the average 401(k) account balance is $106,500. Fidelity holds 16.2 million 401(k) accounts, including my Solo 401(k). Fidelity is consistently ranked as one of the largest 401(k) providers in the country. The median 401(k) account balance, on the other hand, is a paltry $24,800. It’s clear that despite an enormous bull run since the 2009 lows, not enough Americans are saving for retirement or don’t have pre-tax retirement plans like a 401(k). I’m sure it’s a combination of both. What I’d like to do is compare the latest average 401(k) balance by age with my recommended average 401(k) balance by age for financial independence seekers. Let’s see how big the differences are so we can explain how important it is for everybody to focus on their finances. The 401(k) account is one leg of the new three-legged stool for retirement. The other two legs are post-tax savings accounts and personal hustle. It’s important to never depend on the government or anyone for your financial future. Below are the latest average and median 401(k) balances by age range according to Fidelity as of September 2018. Ages 20-29: Average balance: $11,600, Median balance: $4,000. After spending so much time in school, the last thing many young folks think about is saving for retirement. Further, because they’re just starting to make money, their marginal tax rate is likely to be the lowest of their entire career. As a result, their desire to contribute to a 401(k) isn’t very high. That said, it’s important to get into the discipline of saving aggressively and saving often. If you are able to have or develop good financial habits in your 20s, these habits will continue for the rest of your life and make you wealthier. Ages 30-39: Average balance: $43,600. Median balance: $16,500. Your 30s is a time for great career growth after spending your 20s learning. Not only should you be earning more, but you should also finally be able to regularly max out your 401(k). Besides career and income growth, you are likely considering where to establish roots. Buying a primary residence and settling down with a life partner are two items high in consideration. Ages 40-49: Average balance: $106,200, Median balance: $36,900. You should be entering your peak earnings years in your 40s. Maxing out your 401(k) should come naturally, but for some reason, life somehow always gets in the way. Maybe your housing costs are dragging you down. Maybe you went through a costly divorce. Or maybe the cost of raising children is more expensive than you realized. Ages 50-59: Average balance: $179,100. Median balance: $62,700. You finally see the retirement finish line. Participants age 50 and older can contribute an extra $6,000 a year in 2019. This catchup contribution is a 31.5% annual boost, which should be put to good use. Here’s a chart that shows the historical 401(k) contribution limits. As you can see, the employer can contribute a heck of a lot more than you can if they are so generous. Ages 60-69: Average balance: $198,600. Median balance: $63,000. You’re finally able to withdraw from your 401(k) without a 10% penalty. If you live frugally on only $30,000 a year, you can withdraw from an average balance of $198,600 for 6.5 years before you completely run out of money. If you so happen to have only the median 401(k) balance of $63,000 at the age of 60, you will likely have to continue working for many more years, if not forever. Ages 70+: Average: $186,800, Median: $52,400. Given the median life expectancy is around 78 for men and 80 for women, we’ve finally come to an age group where the average 401(k) balance makes more sense. Folks in their 70s are receiving Social Security and many of them have a pension as well from the good old days. If all debt is paid off, having much more than $200,000 at this age probably isn’t necessary. It should be clear by now that the average 401(k) balance for each age group below 70 is too low to afford a comfortable lifestyle in retirement. I can understand the low balance in one’s 20s, but by one’s 30s, everybody should be able to comfortably max out their 401(k) each year. After a 16-day government shutdown in 2013, 64 percent of federal workers said they had less than two weeks’ worth of savings set aside. With the government shutdown in 2019, one career survey highlighted that almost 80 percent of Americans live paycheck to paycheck. That’s nuts! Let’s now compare the latest average 401(k) balance by age in America with the recommended 401(k) balance for those who wish to enjoy a comfortable retirement. * The Guide For Older Savers column accounts for lower maximum contribution amounts available to savers above 45. The column can also be used for more conservative returns. * The Guide For Middle Age Savers column accounts for lower maximum contribution amounts available to savers below 45. The column can also be used for moderate returns. * The Guide For Younger Age Savers column accounts for savers who are under the age of 25. They have higher maximum contribution amounts. After the first year, one maximizes their contribution every year to their 401(k) plan without failure. * Average starting working age is 22. But you can follow the number of years working as a different guideline if you graduate later or earlier. * $18,000 is used as the conservative base case maximum contribution amount for one’s entire working life. For 2019, the maximum contribution has increased to $19,000. * The rate of return assumptions are between 0% – 10%. The asset allocation is based off a traditional asset allocation based on age. * Company match assumption is between 0% – 100% of employee contribution. $56,000 a year is the total amount that can be contributed to a 401k by employee and employer for 2019 ($19,000 employee, $37,000 employer). * The three recommended columns should successfully encapsulate about 80% of all 401K contributors who max out their contributions each year. There will be those with less, and those which much greater balances thanks to higher returns. As you can see from the chart, the average American 401(k) balance starts off light compared to the recommended balance, with the gap really widening over time due to the power of compounding. For a closer apples-to-apples comparison, you can compare the Average American Balance column to the Middle Age Savers column. In this comparison, the financially savvy investor will have greater than 10X more in his or her 401(k) compared to the average American at 60. Please recognize the importance of consistent savings and compounding returns. Over a period of several decades, even a 1% difference in returns or savings rate makes a big difference. My default assumption is that everybody should have at least $1,000,000 in their 401(k) or total pre-tax retirement accounts by the time they turn 60. The range is between $1,000,000 – $5,000,000. A $1,000,000 gross 401(k) account ends up being roughly $800,000 after-tax. Multiply $800,000 by 3% – 5% and you get between a $24,000 – $40,000 a year safe withdrawal rate to spend until death. Depending on where you live and how luxurious you want your retirement to be, $24,000 – $40,000 a year may not be enough. If you plan to retire in a high cost of living area like San Francisco, having 5X that amount for spending might be more appropriate. The good thing about the 401(k) is that it will get help from the after-tax investments you’ve been accumulating all your life as well. Contributing the maximum to your 401(k) should be considered the minimum for all financial freedom seekers. Once you add on your own ingenuity of bringing in extra income during retirement if so desired, you should be able to live as close to your ideal retirement life as possible. Readers, how do you stack up to the average 401(k) by age for Americans? How much are you shooting to have in your 401(k) by the time you can withdraw without penalty? 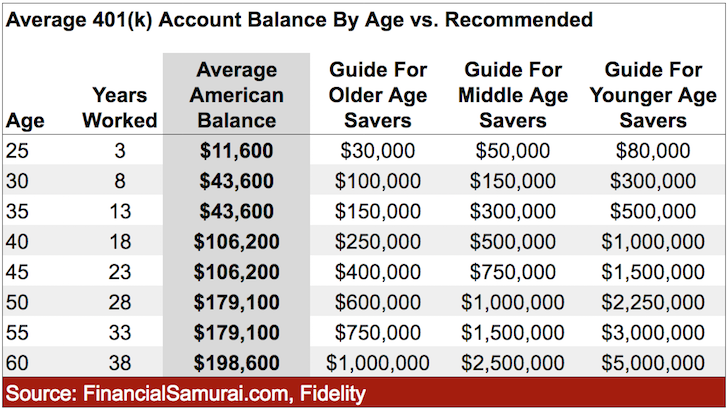 The post Latest 401(k) Balance By Age Versus Recommended Amount For A Comfortable Retirement appeared first on Financial Samurai.